Fire is often thought of something that trees should be protected from, but a new study suggests that some trees may themselves contribute to the likelihood of wildfires in order to promote their own abundance at the expense of their competitors. The study, which appears in the December 2009 issue of the journal The American Naturalist, says that positive feedback loops between fire and trees associated with savannas can make fires more likely in these ecosystems. "We used a mathematical model to show that positive feedback loops between fire frequency and savanna trees, alone or together with grasses, can stabilize ecological communities in a savanna state, blocking conversion of savannas to forest," said the study's leading author Brian Beckage, associate professor in the Department of Plant Biology at the University of Vermont. The study's co-authors are William Platt, professor of biology at Louisiana State University, and Louis Gross, director of the National Institute for Mathematical and Biological Synthesis and professor of ecology and evolutionary biology and mathematics at the University of Tennessee. Beckage was a short-term visitor conducting research at NIMBioS in 2009 and will be on sabbatical at NIMBioS in 2010. The promotion of fire by the savanna trees increases their own abundance by limiting the establishment and growth of tree species that are better competitors for resources and that might ultimately displace the savanna trees. The research results suggest that some trees may modify or "engineer" their environment, including the characteristic fire frequencies in a landscape, to facilitate their own persistence at the expense of their competitors, Beckage said. The research proposes a scenario for the development of savannas in landscapes that would otherwise become closed forests. 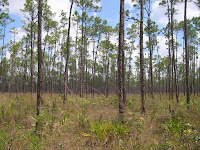 Examples of savanna trees that facilitate frequent low-intensity fires include the longleaf pine and the south Florida slash pine, both of which frequently shed their needles providing fodder for wildfires. The savanna tree initially invades grassland, but by facilitating frequent fires, it limits its own density and thus prevents conversion to a forest.